Institutions for the public distribution of foodgrain were first established in India in 1942, and received further state support with the establishment of the Food Corporation of India (FCI) in 1965. Currently, India runs the world’s largest public food distribution system, and supplies rice and wheat through designated fair price shops (FPS) throughout the country (Sekher et al. 2017). The National Food Security Act (NFSA), 2013, seeks to “provide for food and nutritional security . . . by ensuring access to adequate quantity of quality food at affordable prices” (GoI 2013). The Act proposes bringing nearly 75 per cent of the rural population and 50 per cent of the urban population of India under the public distribution system (PDS). The NFSA provides for the distribution of millets through the PDS. Millets are a rich source of fibre, minerals, and Vitamin B complex. Finger millet (ragi) has a high calcium content. Millets are also a rich source of phytochemicals, which act as antioxidants and detoxifying agents (Devi et al. 2014). Given that millets are naturally nutrient dense cereals, making them available through the PDS can help address the problem of micronutrient deficiency or hidden hunger among the poorer sections of the population. Effective delivery of millets under the PDS could thus have far-reaching implications for addressing the problem of malnutrition. While Chhattisgarh pioneered a model of local procurement and local distribution of pulses, another nutritionally dense food item, through the PDS, and Tamil Nadu has distributed pulses through the PDS over the last decade, Karnataka is the first State to distribute millets through the PDS. In 2013–14, the Government of Karnataka (GoK) initiated the procurement of millets – finger millet in south Karnataka and sorghum in north Karnataka – from farmers, and distributed these through the PDS. The scheme, titled “Anna Bhagya Yojana,” had the twin objectives of procuring millets from farmers with corresponding cash flows to rural farm households, and allowing households with PDS cards to gain access to nutritious foodgrain at low prices (KAPRICOM 2014). Although procurement began in 2013–14, the scheme had only limited success. In 2014–15, the Government of Karnataka assigned the Karnataka Agricultural Price Commission (KAPRICOM) to study the issue and suggest measures to increase the procurement of millets. The study found that over the last two decades, the area under cultivation of millets had steadily declined, and profitability vis-à-vis other competing crops had fallen sharply. It recommended four key measures: i) an increase in the minimum support price (MSP) for finger millet and sorghum such that a mark-up of at least 20–30 per cent over the cost of cultivation, as estimated by KAPRICOM, could be offered, in line with the recommendations of the National Commission on Farmers (CIFA 2007); ii) a reduction in the incentives given to maize and cotton, the chief competitors of finger millet and sorghum; iii) promotion of millets as crops that can adapt to climate change; and iv) investment in research to produce new high-yielding varieties, making them attractive to farmers (KAPRICOM 2014). Following this, the State Government offered a bonus of Rs 450 per quintal over the minimum support price (MSP) for finger millet in 2014–15 and Rs 750 for maldandi sorghum, making the MSP Rs 2,000 per quintal for finger millet and Rs 2,300 per quintal for sorghum in 2014–15.2 As a result, the procurement of finger millet increased from 0.72 million MT (metric tonnes) in 2013–14 to 13.6 million MT in 2014–15, and that of sorghum from 2 MT in 2013–14 to 6,839 MT in 2014–15. Encouraged by this, the MSP for finger millet was further enhanced in 2015–16 to Rs 2,250 per quintal, and procurement increased to 15 million MT. However, there was no procurement of sorghum in 2015–16 because of crop failure that year (GoK 2016). Secondary data from reports of the NSS 61st and 68th Rounds of household consumption expenditure (NSS 2007, 2014) were used to examine the pattern of consumption of millets in Karnataka. The area under production of millets was examined using data from the Karnataka Food and Civil Supplies Corporation (KFCSC). Analysis of remote sensing data was undertaken at the M .S. Swaminathan Research Foundation (MSSRF), Chennai, to examine the area under finger millet and sorghum in four selected districts of the State. Interviews were carried out with policy makers at the KFCSC, the Department of Food, Civil Supplies, and Consumer Affairs, the Karnataka Agriculture Price Commission, the Central Warehousing Corporation (CWC), and the Karnataka State Agricultural Marketing Cooperative Federation. Third party assayers hired by grain procurement agencies and the FCI were also interviewed. Primary surveys were carried out in four districts of the State. Districts with the highest procurement and distribution of finger millet through the PDS (Mandya and Tumkur in south Karnataka) and of sorghum (Gadag and Dharwad in north Karnataka) were selected for the primary survey.3,4 In each district, the sub-district (taluk) with the highest procurement was selected. Agriculture was the main occupation of the people in all four districts selected for study. Mandya is an important producer of rice, finger millet, and tomato. Tumkur is a significant contributor to the State’s production of finger millet, pigeon pea, and dry chilli. Gadag is among the major districts in the State contributing to the production of sorghum, pearl millet, Bengal gram, groundnut, sunflower, dry chilli, onion, and cotton. Dharwad contributes to the production of sorghum, soybean, potato, dry chilli, and cotton (KAPRICOM 2015). The survey comprised questionnaire-based household interviews. It covered consumers and producers in rural areas, and consumers in urban areas. Within a sub-district, 35 farmers from five village panchayats were randomly chosen and interviewed from among a list of farmers who had sold finger millet or sorghum to the government agency under MSP-based procurement. In addition, 15 farmers from the same five panchayats who had not supplied under MSP procurement were also interviewed, bringing the sample to a total of 50 farmers in each district. Thus, a total of 200 farmers were interviewed to collect information on issues related to production, pricing, and procurement. In addition, in-depth interviews were conducted with three farmers in each district who had responded during the primary survey, for a detailed assessment of the cost of cultivation and problems related to MSP-based procurement. In the same districts, a consumer survey was conducted across 50 rural and 50 urban households, after ensuring that they were either BPL (below poverty line) or AAY (Antyodaya Anna Yojana) cardholders and eligible to receive grains under the PDS. Households covered by the farmer survey in each district who fell in this category were included as part of the consumer survey sample. Urban households for the sample were selected from the district headquarters. In order to choose BPL or AAY consumers in urban settings, the survey was conducted in slums in the district headquarters. Thus, 50 rural and 50 urban PDS consumers (total 100) were surveyed in each district, bringing the total sample size from four districts to 400. The woman of the household was chosen as the respondent for this survey. The survey tried to identify consumer preferences for millets as compared to rice and wheat, and the quantity of millets required per month per family. We attempted an alternative estimate of the area under millets using satellite imagery of the selected districts for three years, starting with the most recent year and going back at intervals of five years, i.e. 2015, 2009, and 2005. Images for 2010 were not clear due to cloud cover during the growing period of the selected crops, hence images for the previous year were used. We find that the area under millets had fallen in all four study districts between 2005 and 2015. Table 1 compares GIS data with data from government sources. The comparison has been done only for 2005 and 2009 as district-wise government data for 2015 are not available. The area under millets in Dharwad and Mandya districts is lower in government statistics as compared to GIS estimates, but the opposite is the case for Gadag and Tumkur districts. However, both government and GIS estimates show a fall in the area under millet production in the four selected districts between 2005 and 2009–10. GIS data, based on satellite imagery, confirm the decrease in area under millets.6 In 2015, as per GIS data, there was an increase in area under millets in Gadag, and Tumkur. The increase was possibly due to the procurement of millets by the government, but it is not possible to ascertain this. A majority of the farmers surveyed in Dharwad and Gadag districts held medium and large operational holdings, while in Mandya and Tumkur districts, the majority of farmers were small and semi-medium landholders. Finger millet was cultivated in the kharif (monsoon) season under rainfed conditions in Tumkur and under irrigated conditions in Mandya. Sorghum was primarily cultivated in the rabi or post-monsoon season in Dharwad and Gadag districts. Source: Authors’ calculation based on data from the primary survey, 2016–17. In each district, in-depth interviews were conducted with three randomly selected farmers, in order to collect data on cost of cultivation and on problems related to selling under the MSP-based procurement system. The analysis shows that the announced MSPs of Rs 2,250 per quintal for finger millet and Rs 2,300 per quintal for sorghum were more than the actual costs incurred by farmers (cost A1) and the imputed costs of family labour (cost A1+FL). However, cost C3 (including land and management costs) was higher than the MSPs for sorghum in Dharwad and finger millet in Tumkur. One reason for the relatively high C3 cost in Tumkur was its proximity to Bengaluru, which raised the imputed cost of land (see Table 3). Notes: Cost A1 = all cash expenses incurred by the farmer; FL = family labour at opportunity cost; cost C3 = total cost including cost A1, FL, imputed cost of land rental or rent paid, and managerial costs of the farmer. Source: In-depth interviews with farmers, 2016–17. Note: Fifty farmers in each district were sampled. While Table 3 is based on the responses of 50 farmers in each study district, in-depth interviews with farmers and traders in each district revealed that the majority of farmers did not take their produce to the Agriculture Produce Market Committee (APMC) yards. In fact, none of the twelve farmers (three in each district) interviewed had sold to the APMC. Instead, most farmers sold to the nearest kirana or grocery shop, which also doubled as a collection point for big traders. This is confirmed by official data (Table 5), which show that less than 5 per cent of the total production of finger millet and sorghum over the decade 2005–15 reached the APMC. Thus, most farmers are unlikely to have received the MSP. Discussions with the farmers revealed that the market price they received was lower than the MSP. In fact, many of them mentioned that after the new MSP of Rs 2,250 per quintal of finger millet was announced by the government, wholesale prices in informal markets had gone up to Rs 1,800 per quintal (Table 3). One reason for this may be that the government opens special centres for procurement for a limited period every year. Source: Dacnet and FRE/Final Estimates of DE and S Bangalore; http://krishimaratavahini.kar.nic.in/reports/Main_Rep.aspx. Almost 87 per cent of households in Karnataka reported some consumption of millets or sorghum.10 The data show that a large proportion of these consumers of millets reside in rural areas of the State. The proportion of households consuming millets was higher among those in lower expenditure deciles. Further, for about 48 per cent of the population of rural and urban Karnataka, millets accounted for 20 to 40 per cent of total cereal consumption (Figure 1). Only three per cent of the population reported that the share of millets in total consumption of cereals was greater than 50 per cent. Source: NSS 68th round, 2011–12. However, there was a decline in consumption of millets in both rural and urban areas between 2004–05 and 2011–12. The decline in millet consumption occurred in the context of an overall decline in cereal consumption across both rural and urban households (Table 6). Among cereals, the consumption of rice increased and that of wheat remained unchanged, but the consumption of other cereals decreased. The average per capita monthly consumption of finger millet by rural households fell from 1.8 kg in 2004–05 to 1.2 kg in 2011–12, and from 1 kg to 0.8 kg for urban households. Similarly, the per capita monthly consumption of sorghum for rural households declined from 2.3 kg in 2004–05 to 1.4 kg in 2011–12, and from 1.2 kg to 0.7 kg for urban households in the same period. Sources: NSS 61st Round (2004–05); NSS 68th Round (2011–12). Under the Anna Bhagya Yojana, households with below poverty line (BPL) cards received 3 kg of rice and 2 kg of wheat in north Karnataka, and 4 kg of rice and 1 kg of wheat in south Karnataka, free of cost. Sugar and edible oil were also supplied at subsidised prices.11 Provision of millets was introduced on a pilot basis. Our survey of 100 consumers in each district revealed that rice, sorghum, and wheat were important cereals in the food basket of households in rural and urban areas of Dharwad and Gadag districts, while rice, finger millet, and wheat were important in Mandya and Tumkur districts. Based on reported frequency and quantity of consumption of each grain, the per capita average quantity consumed per month was calculated (Table 7). Note: Calculation based on sample of 50 rural and 50 urban households in each district. Source: Authors’ calculations in Rajshekar and Raju (2017). Respondents were also asked to rank their preference among rice, wheat, and finger millet or sorghum along with reasons for the same. This question was asked to assess the receptivity towards provision of millets through the PDS. Rice was the respondents’ first choice in both north Karnataka (Dharwad and Gadag) and south Karnataka (Mandya and Tumkur). Finger millet and sorghum were the second most preferred grain, and wheat ranked a distant third in all districts, making millets a suitable substitute. Some of the reasons given for the strong preference for rice were its taste, ease of preparation, and popularity with children. Finger millet and sorghum were preferred for their nutritive value and by those engaged in physical labour. In terms of sources of cereals, the main source of rice in rural areas was market purchase in all four districts; even in rice-growing areas such as Mandya and parts of Tumkur, purchase of rice was substantial. One reason for this could be that a substantial proportion of the sample population was landless.13 Similarly, a large proportion of finger millet and sorghum too was obtained from the market. Wheat was obtained primarily from the PDS in Mandya and Gadag districts; there was relatively higher purchase of wheat from the market in Tumkur and in Dharwad. In Dharwad, several respondents said that during the rabi season, farm workers were paid wages in the form of (maldandi) sorghum. For urban consumers, the main source of all foodgrain was the market, except for wheat, which was bought from the PDS in all districts except Mandya. A majority of the respondents, when asked about desired changes in the PDS, did not want an increase in the quantity of millets supplied if it was at the cost of a lower quantity of rice. The main reasons given were that (a) the quantity of rice supplied was already insufficient, and that (b) farmers could grow finger millet and sorghum if required, but could not grow rice as easily. Source: PDS cardholders from Economic Survey of Karnataka, 2014–15. In Dharwad and Gadag (north Karnataka), around 50 per cent of current production is needed to meet the requirements of the PDS if it were to cover all BPL and AAY families. In the case of Mandya and Tumkur (south Karnataka), the same requirement is about 20 per cent of current production. With current production levels, given that less than 5 per cent of the produce reaches the market, procurement of this magnitude will be difficult. Further, despite the hike in MSP for finger millet and sorghum, the quantities required for the PDS were not procured in Karnataka in 2015–16; only 0.15 million MT of finger millet were procured, and hardly any sorghum. Below, we elaborate on some of the problems of procurement. An attractive purchase price or MSP can act as an incentive for farmers to produce more and sell more to official agencies. This would require the purchase price to be announced well before the sowing season, so that farmers can allocate adequate land area to the crop. Farmers should be assured that the offered MSP will be honoured at the time of harvest. Even with appropriate prices, the physical act of procuring millets remains a major problem. The procurement window of January to March, as observed during the primary survey, is too short. While finger millet is harvested in this period, the harvest of sorghum would not be complete. Further, as farmers exchange millets for other products during the course of the year, procurement may be extended for at least another quarter or till the onset of the next monsoon, when farmers will be in a better position to assess whether to store or sell. Payment terms must also be attractive. Delay in payment can dissuade sellers, especially if it extends as long as 60 days. In such situations, even an attractive MSP may not lead to higher production. The staff members deputed from procurement agencies are not specialists in millet procurement; they may be trained in assessment of the quality of rice and wheat, but not millets. This makes them diffident about assessing the quality of the grain being procured. Further, the staff members are supported by third party assayers, who are expected to assess the quality of the produce and certify it immediately. The third party assayers we met in Mandya told us that they were unable to carry out quality checks in many centres. The procurement centres in turn reported that they had to deal with unmanageable crowds. Lack of storage facilities was another problem reported by procurement officers. Adequate planning in terms of prior identification of storage godowns and arranging rental agreements in advance would help avert such a situation after the millet is procured. The role of the procurement agency in organising itself and the act of procuring is crucial to ensure successful procurement of millets. The Karnataka Food and Civil Supplies Corporation (KFCSC), the main procurement agency in the State, has in place a strong Management Information System (MIS) architecture, which helps ensure that millets are procured from genuine farmers. For example, it has stipulated the need for an RTC (as proof of being a farmer and cultivating a certain area under millets), fixed a quantity of grain that it will procure per acre, and made arrangements for direct cash transfer to the bank account of the seller. In addition, appointing a third party assayer strengthens the KFCSC team in its assessment of the quality of millet being procured. Having its own staff in all districts of the State makes it easy to manage all the procurement centres. It is our view that with experience, the KFCSC will improve its ability to manage the procurement process efficiently and smoothly. This will require extending the procurement window and ensuring cash flow to the KFCSC. Decentralised procurement and distribution are important given the location-specific preference for millets. As different millets are produced and consumed by different communities across the State, a mechanism of decentralised procurement can be of help to the processes of procurement and distribution. Pilots conducted by two NGOs, Watershed Support Services and Activities Network (WASSAN) and Deccan Development Society (DDS), offer insights on local procurement and distribution (WASSAN 2009; DDS 2004). Both initiatives were based on extensive mobilisation of the community and close association with the two NGOs. Lastly, as millets are an important staple food of the region and can be stored easily, farming households tend not to sell millets. Thus, procurement is a problem not only on account of low production, but also due to farmers’ own consumption requirements. Soon after the enactment of the National Food Security Act in 2013, which provided for inclusion of millets in government food distribution programmes, the Karnataka Government began to procure millets for distribution through the public distribution system (PDS). Once referred to as coarse cereals, millets are now called nutri-cereals in recognition of their nutritive value. According to official statistics, the area under millets in Karnataka has declined. Remote sensing data confirm the decline, although there were differences between the two sources of data with respect to the precise acreage under millet. GIS data are an important instrument for monitoring the area under millet crops and land-use planning. The State Government has offered attractive procurement prices, including a bonus over and above the Minimum Support Price (MSP) announced by the Central Government, to encourage farmers to grow millets and ensure availability of sufficient quantities for procurement. Our interviews with farmers showed that the MSP did cover the actual cost of production (A1) and imputed cost of family labour, making it attractive for them to cultivate millets. If announced on time and sustained, this price should encourage farmers to switch to millets from, say, cotton and maize, which have replaced millets in recent years. The major tasks are to streamline the procurement mechanism, equip officials with proper training in quality assessment, create a longer procurement window in line with the harvest period of the crop, and reduce the time between procurement and payment. There are also issues of storage after procurement since the current arrangements are for stocking rice and wheat. Together with the price incentive, if the procurement window is extended by three to four months, pressure on the procurement team will ease and allow for more procurement. With experience, existing procurement agencies will be able to deliver better. Issues of cash flow and storage, will however, have to be addressed. Delays in payment can dissuade sellers, especially if the wait is as long as 60 days, as was reported in the producer survey. On the consumer side, the demand for millets is strong in Karnataka, and finger millet in south Karnataka and sorghum in north Karnataka form an important part of the household food basket. However, consumer preferences for different kinds of millet in different parts of the State call for a decentralised procurement and distribution mechanism. Consumer preferences and cultural factors will have to be taken into account, and awareness created regarding the benefits of consuming millets. In general, since a large part of agriculture in India is rainfed, millets may be the ideal crops on which to focus, given their high nutrition content and resilience to climate stress. This requires public support for research and extension, so as to increase the productivity of millets and ensure that farmers gain access to improved varieties of seeds. Incentives for increasing production and productivity, coupled with awareness campaigns through the media and other means, can help increase the supply of millets and allow nutritionally vulnerable populations to gain access to them through State-led food distribution programmes. The Karnataka experience offers some insights into the potential and problems of introducing millets into the public distribution system. Acknowledgements: The authors gratefully acknowledge the contribution of R. Nagarajan, Senior Scientist, GIS and Remote Sensing Lab, M. S. Swaminathan Research Foundation (MSSRF), in coordinating the collection and analysis of GIS and remote sensing data. This study is part of an ongoing research programme on Leveraging Agriculture for Nutrition in South Asia (LANSA), funded by UK Aid, Department for International Development, UK. The study was presented by the authors to government officials in Karnataka at a meeting convened by the Additional Chief Secretary and Development Commissioner, Government of Karnataka, at his office on June 22, 2017. 1 This paper draws on the research report, “Introduction of Millets in PDS: Lessons from Karnataka,” prepared by Rajshekar and Raju (2017). 2 Maldandi (also known as bilijola or white sorghum), a traditional variety of sorghum that is grown in north Karnataka during the rabi or winter season, is preferred as a foodgrain. The hybrid variety grown during the kharif or monsoon is not consumed in this area of the State. Therefore, the GoK procures only the maldandi variety and announces a separate MSP for it. 4 Karnataka Food and Civil Supplies Corporation, Retail Point – District Wise Allotment and Lifting, Karnataka PDS data centre, Government of Karnataka (GoK), available at http://kfcsc.kar.nic.in/kfcscdd/dist_ret_pt_lift_stat_t.aspx. 5 See, also, Malathi et al. (2016), Directorate of Millets Development (2014). 6 The reasons for differences between GIS data and government data need further study. 9 Procurement ends in March every year, which is when governments try to restrict cash expenditure it is the end of the financial year. 10 Authors’ calculation from NSS (2011–12); see Rajshekar and Raju (2017). 11 See https://ahara.kar.nic.in; there have been changes subsequently and only 7 kg of rice are now supplied. 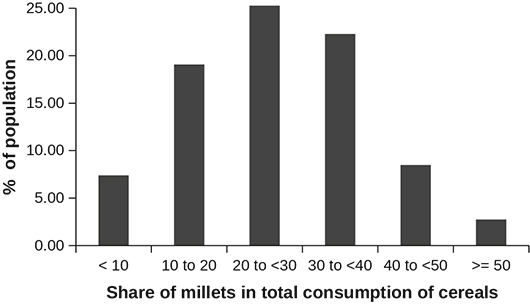 12 Our estimates of millet consumption are higher than the averages reported in NSS data. This is not surprising as we selected districts with high procurement and distribution of millets. 13 Forty-two per cent of all rural households sampled were landless. 14 All BPL and AAY cardholders in the district are eligible to receive millets under the PDS. 15 The KFCSC has in place an extensive ICT-enabled MIS (Management Information System) to capture the details of farmers who supplied under MSP procurement. This system was of use in carrying out this study, especially in identifying farmers who had sold under MSP procurement. Ashok, S. R., and Sasikala, C. (2011), “Trends in Production and Comparison of Cost of Production and Minimum Support Price of Coarse Cereals,” Madras Agricultural Journal, vol. 98, nos. 4–6, pp. 189–92. Consortium of Indian Farmers Association (CIFA) (2007), National Commission on Farmers: Findings and Recommendations, available at http://indianfarmers.org/indianfarmers/wp-content/uploads/2018/01/M.Swaminathan-Report-Natnl..Common-Farmers-Findings-Recommdns.pdf, viewed on January 22, 2018. Deccan Development Society (DDS) (2004), A Study on Alternative Public Distribution System: A Novel Initiative of Deccan Development Society,” available at http://www.vikalpsangam.org/static/media/uploads/Resources/alternative_pds_at_dds_srinivas_thapa_2004.pdf, viewed on February 5, 2018. Devi, P. B., Rajendran, Vijayabharathi, Sathyaseelan, Sathyabama, Nagappa, Gurusiddappa Malleshi, and Venkatesan, Brindha Priyadarisini (2014), “Health Benefits of Finger Millet (Eleusinecoracana L.) Polyphenols and Dietary Fibre: A Review,” Journal of Food Science and Technology, vol. 51, no. 6, pp. 1021–40, June, available at https://www.ncbi.nlm.nih.gov/pmc/articles/PMC4033754/pdf/13197_2011_Article_584.pdf, viewed on November 15, 2018. Directorate of Millets Development (2014), “Status Paper on Coarse Cereals,” Department of Agriculture and Cooperation, Ministry of Agriculture, Government of India, available at http://www.nfsm.gov.in/Publicity/2014-15/Books/Status%20Book.pdf, viewed on January 2, 2018. Divya, G. M., Krishnamurthy, K. N., and Gowda, D. M. (2013), “Growth and Instability Analysis of Finger Millet Crop in Karnataka,” Mysore Journal of Agricultural Science, vol. 47, no. 1, pp. 35–39. Government of India (GoI) (2013), National Food Security Act (NFSA), Ministry of Law and Justice, New Delhi, September 10, available at http://indiacode.nic.in/acts-in-pdf/202013.pdf, viewed on April 20, 2017. Government of Karnataka (GoK) (2016), “Economic Survey of Karnataka (2015–16),” Department of Planning, Programme Monitoring and Statistics, Bengaluru, available at http://des.kar.nic.in/docs/Economic%20Survey%202015-16_English%20Final.pdf, viewed on March 10, 2017. Karnataka Agricultural Price Commission (KAPRICOM) (2014), Crop Production Statistics, available at http://kapricom.org/crop_production_statistics.html, viewed on December 15, 2015. Karnataka Agricultural Price Commission (KAPRICOM) (2015), “Cost of Production and Perspective Report,” available at http://kapricom.org/downloads/reports/Exc_Sum_Eng_Report_2015.pdf, viewed on January 10, 2018. Malathi, B., Appaji, Chari, G., Reddy, Rajendar, Dattatri, K., and Sudhakar, N. (2016), “Growth Pattern of Millets in India,” Indian Journal of Agricultural Research, vol. 50, no. 4, pp. 382–86. National Academy of Agricultural Sciences (NAAS) (2013), “Role of Millets in Nutritional Security of India,” Policy paper no. 66, NAAS, New Delhi, December. National Sample Survey Organisation (NSSO) (2007), “Household Consumption of Various Goods and Services in India, 2004–05” National Sample Survey 61st Round, Ministry of Statistics and Programme Implementation, Government of India, New Delhi, available at http://mospi.nic.in/sites/default/files/publication_reports/509_P1_final.pdf, viewed on February 22, 2016. National Sample Survey Organisation (NSSO) (2014), “Household Consumption of Various Goods and Services in India, 2011–12” National Sample Survey 68th Round, Ministry of Statistics and Programme Implementation, Government of India, New Delhi, available at http://mospi.nic.in/sites/default/files/publication_reports/Report_no558_rou68_30june14.pdf, viewed on February 22, 2016. Nithya, D. J., and Bhavani, R. V. (2017), “Dietary Diversity and its Relationship with Nutritional Status among Adolescents and Adults in Rural India,” Journal of Biosocial Science, available at https://www.cambridge.org/core/terms, https://doi.org/10.1017/S0021932017000463, viewed on December 20, 2018. Rajshekar, and Raju, S. (2017), “Introduction of Millets in PDS: Lessons from Karnataka – A Report,” MSSRF/RR/17/41, M. S. Swaminathan Research Foundation, Chennai, available at http://59.160.153.185/library/sites/default/files/Millets%20in%20PDS%20Study.pdf, viewed on December 15, 2017. Sekher, M., Parasuraman, S., Pritchard, Bill, Kumar, Sandhya S., and Rai, Rajesh Kumar (2017), “A Process Mapping Analysis of Six Indian States Empowering People to Power the Public Distribution System,” Economic and Political Weekly, vol. 52, no. 51, p. 23. Watershed Support Services and Activities Network (WASSAN) (2009), “Introducing Millets into Public Distribution System (PDS): A Pilot Project by WASSAN in Andhra Pradesh,” DHAN Foundation, Madurai, available at http://www.dhan.org/smallmillets/docs/report/Introducing_millets_into_Public_Distribution_System.pdf, viewed on February 22, 2016.